All names relating to fundamentals, to principles, or to the center have always designated an invariable presence; presence as opposed to absence. However, the space that dissolves any two things is commonly underestimated as having less presence than its tangible structure. 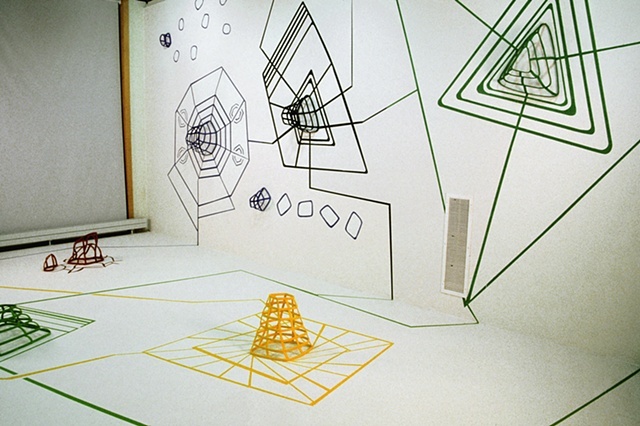 This installation pushes three dimensional patterns into the space of movement that is inhabited by the viewer, and reveals points within the environment that capture the viewers gaze and dissolve the three dimensional patterns into the wall or floor expanse. When the viewer stands in these positions the physical presence of the constructions melt away.